We report a 60 year male with long history of joint pain later diagnosed as rheumatoid arthritis (RA) who presented with dyspnoea and swelling over neck& upper chest. A clinical diagnosis of superior vena cava (SVC) syndrome was made. Patient fulfilled criteria for definite rheumatoid arthritis supported with positive serology. Contrast enhanced computerized tomography (CECT) scan of chest revealed thrombosis in SVC. Patient was investigated for the cause of SVC thrombosis. Anti nuclear antibody (ANA) test was negative. Anti cardiolipin antibody was done to rule out antiphospholipid antibody (APLA) syndrome which has a known association with rheumatoid arthritis to cause intravascular thrombosis but was negative. Digital rectal examination (DRE) and prostate specific antigen (PSA) levels were normal. Further investigations as a part of thrombophilia work up were normal. There are case reports where RA is associated with SVC syndrome but only when it is associated mediastinal lymphadenopathy or SVC thrombosis due to APLA Syndrome. This case suggests RA per se as hypercoagulable state. Dharmshaktu P, Bhowmick J, Dhanwal D. Superior vena cava syndrome due to intravascular thrombosis in a patient with rheumatoid arthritis without antiphospholipid antibody syndrome: Is rheumatoid arthritis a separate hypercoagulable state? Russian Open Medical Journal 2014; 3: 0109. Superior vena cava (SVC) carries blood from the head, neck and upper limb to the heart. It carries about one third of the venous return to the heart. 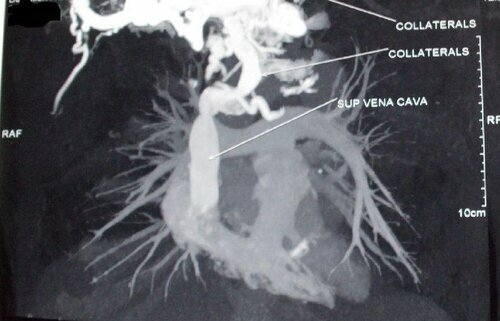 Superior vena cava syndrome is characterized by superior vena cava obstruction with severe reduction in venous return. Compression of the vena cava may result from extra luminal compression by mass present in middle or anterior mediastinum including right paratracheal lymph nodes, lymphoma, thymoma, aortic aneurysm or any inflammatory process leading to fibrosing mediastinitis [1-5]. Intravascular thrombosis of SVC can also give rise to this entity but are mostly associated with malignancies. Rheumatoid arthritis (RA) is not considered to be associated with intravascular thrombosis. Only few cases have been reported where RA is found to be associated with intravascular thrombosis [6-11]. Our present case represents RA per se as the thrombotic state for SVC thrombosis after ruling out all other possible causes. We could not found any other previous case report in the literature where rheumatoid arthritis was found to be the cause for SVC thrombosis without any associated antiphospholipid antibody (APLA) syndrome. A 60 year old male presented to our hospital with complaints of joint pain including both major and minor joints with exclusion of distal interphalangeal joints for past 8 to 9 years. He was also giving history of morning stiffness. 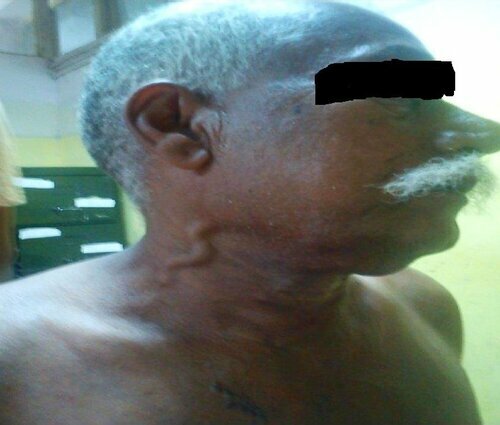 For past 8 months to one year he developed dyspnoea on exertion and swelling over face, neck and anterior chest region (Figure 1). He was taking some pain killers and oral steroids prescribed by some private practitioner with which he used to get temporary relief, records of that treatment was not available. On examination he had engorged and dilated veins over neck, upper chest and facial puffiness. Slight flexion deformity was present over proximal interphalngeal joints of both hands. Chest, cardiovascular system and abdominal examination revealed no abnormality. A clinical diagnosis of rheumatoid arthritis and SVC obstruction was made. Complete blood count revealed hemoglobin (Hb) of 13.2 gram%, total leucocyte count of 8300 cells per cumm, platelet counts of 1.73 lacs and erythrocyte sedimentation ratio (ESR) of 53. Serum creatinine and urine analysis were normal. Serology for rheumatoid arthritis including RA factor and anti cyclic citrullinated peptide (CCP) antibody were reactive. Chest X-ray was normal. Further contrast enhanced computerized tomography (CECT) with angiography of chest was done which revealed a non opacification of right sided superior vena cava with hypodense filling defect noted within suggestive of chronic thrombosis and multiple dilated collateral venous channels (Figure 2 and 3). Further work up for SVC thrombosis was planned. Prothrombin time (PT) was normal. Activated plasma thromoplastin time (APTT) test was slightly prolonged at 29.2 seconds with control of 27.1 seconds. Anticardiolipin antibody was done to rule out APLA syndrome but it was negative. Kaolin clotting time was not prolonged. Serm homocysteine levels were normal. Other investigations for genetic causes of thrombophilia including protein C and S deficiency, factor V mutation and AT III deficiency were ruled out. Patient was started on anticoagulation including warfarin, disease modifying anti rheumatic drugs (DMARD’s) including methotrexate, hydroxychloroquine and non steroidal anti inflammatory agents (NSAID’s). Patient improved symptomatically and discharged on above treatment with an advice to follow up. Patient is in our regular follow up. SVC thrombosis secondary to RA is a rare entity. Other common causes of SVC thrombosis must be ruled out. Whenever there is a high index of suspicion for RA per se to cause SVC thrombosis, other causes must be ruled out by extensive work up and patient should be investigated for RA. SVC syndrome which was first described by William Hunter in 1757 is the clinical manifestation of superior vena cava obstruction with severe reduction in venous return from the head, neck and upper extremities. Malignant tumors such as lung cancer, lymphoma and metastatic tumors are responsible for the majority of cases [1-3]. Around 60-90% of SVCS cases are due to tumors . Hypercoagulable states have also become an important etiology for SVC syndrome. Although SVC obstruction is mostly related to malignant process but many different causes have also been described. Among benign etiologies there are tuberculosis, fibrosing mediastinitis, thrombosis secondary to indwelling central venous devices or pacemaker leads, retrosternal thyroid, aortic aneurysm and thymoma . Clinical features of SVC syndrome include facial and neck swelling (82%), upper limp edema (68%), dyspnea (66%), cough, dilated chest veins, dysphagia, hoarseness, orthopnea and in severe cases cerebral edema with neurologic dysfunction and laryngeal edema with acute airway compromise. Diagnosis of SVC syndrome relies on symptoms and physical signs, and is confirmed with the help of ultrasound doppler, computerized tomography (CT) with venography, and by trans-thoracic echocardiography . The treatment of SVC syndrome is supportive with anticoagulation drugs, oxygen supplementation and diuretics, or interventional by endovascular surgery by stenting of the SVC or open surgery . The role of steroid treatment is not proven it and may aggravate patient’s status due to fluid retention. There may be a place for very short therapy with steroids in patients with airway edema . Anticoagulation therapy is the mainstay of therapy and is administered for approximately one year especially in the presence of pacemaker leads. Sometimes anticoagulation is continued for lifetime. RA is not considered to be associated with thromboembolic disorders or predisposition to either arterial or venous thrombosis. A thorough review of literature revealed few cases where venous thrombosis is associated with rheumatoid arthritis in the presence of other confounding factors or coexisting illnesses. Literature says that there are only few possible mechanism for SVC thrombosis in patients with RA, first in association with Anti phospholipid antibody syndrome (APLA)  in a patient with other autoimmune diseases. Cases have been reported where SVC was found in patient of RA in an association with Anti phospholipid antibody syndrome (APLA) in a patient with coexisting systemic lupus erythematosus (SLE). Secondly, due to presence of mediastinal lymphadenopathy which can compress upon SVC leading to extraluminal obstruction of SVC . Other reported cases of intravascular thrombosis in RA have been attributed to nephrotic syndrome , thrombocytosis  or eosinophilia . Activation of coagulation related to underling immune complex mediated systemic vasculitis has also been reported in few cases . In systemic systemic juvenile onset rheumatoid arthritis there has been documented cases of disseminated intravascular coagulation (DIC) as well as laboratory evidence of activation of intravascular coagulation possibly due to endothelial cell damage from vasculitis. There is one case where SVC thrombosis occurred as a part of trousseau’s syndrome in a patient with prostatic carcinoma . Our patient did not have SLE associated antiphospholipid antibody syndrome or mediastinal lymphadenopathy as a cause of SVC obstruction. There were also no feature suggestive of DIC or nephrotic syndrome. The cause of intravascular thrombosis in our patient is unexplained. This case emphases that in a patient with unexplained cause of intravascular thrombosis, one should also keep in mind the possibility of rheumatoid arthritis and patient should be investigated for RA also as a part of thrombophilia work up. The authors have obtained specific informed written consent of the patient in regards to the publication of the case report. Every care has been taken in the photography and description to avoid personal identification of the patient. All of the authors are aware of this submission of case report in this journal, and there is no conflict of interest. There is no commercial interest, intent or dispute in regards to the submission of the case report. The case study is submitted with a pure academic pursuit. Dinesh Dhanwal – MD, Professor, Director, Endocrinology division, Maulana Azad Medical College, New Delhi. © 2013, Dharmshaktu P., Bhowmick J., Dhanwal D.